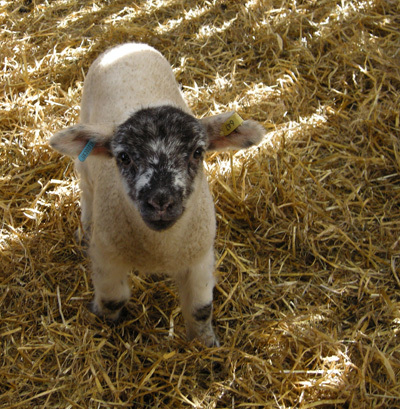 We have visited Ash End House Farm with our baby son and 3 year old daughter twice in the last two months. It’s not often that we would return to the same tourist attraction in such quick succession, especially consider that it’s not free and it is a considerable distance from our house. Certainly one of the main reasons for our return visit was that our daughter had enjoyed the first so much, and that she was the one that asked to go again. Prices are quite reasonable for adults and older children, but disappointingly they charge for children from a young age. The signs say that children should pay from about 1 year old, although we didn’t pay for our 14 month old baby. If you don’t pay for a baby then they won’t be able to partake in some of the activities (such as stroking a baby chicken), but on the other hand you don’t really want to pay for a baby that may sleep through much of the day. I really do think that they could allow babies a little bit more involvement without charging so much. 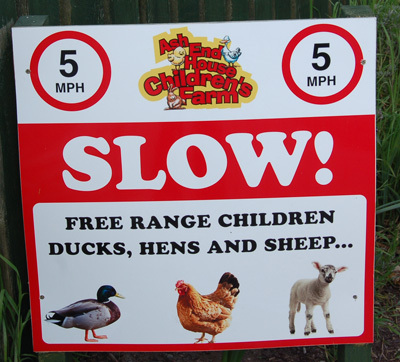 When visiting the farm you are free to visit the different animals as you wish, but there are a lot of activities scheduled at specific times. Most of these are repeated several times during the day, so if you can’t make one there is usually another opportunity. Our daughters favourite scheduled activity was the chicken session. This started with a talk about baby chickens, a sing-a-long “Happy Hatch-day” (many of the activities included some kind of sing-a-long) and an opportunity to stroke and/or handle a baby chicken and duckling. 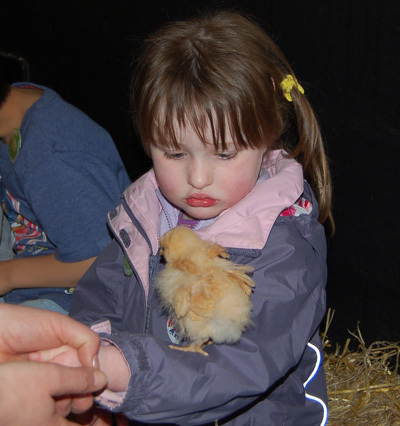 After that they took the children into a barn with some hens for another sing-a-long (Chick-chick-chick-chick chicken) and a chance to pick an egg from a hens nest box which they could take home. Other activities included feeding the baby goats (including the child having a short hold of the bottle on the not-so-busy day) and a sit-on-a-horse session. The farm has a number of sheep, goats, and pigs as well as a large selection of poultry most of these are indoors so just as good when it rains. There are also 3 horses, a few ponies and donkeys, but oddly only one cow (although she was pregnant when we visited, so maybe they’ll be two). 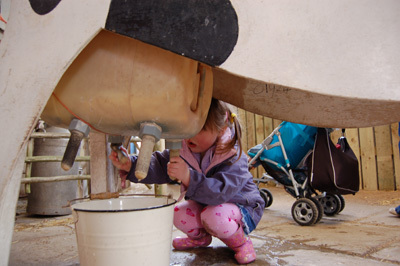 There is an indoor play area with some tractors and large toys as well as three outdoor playground areas (one of which is outside the entrance). There is also a giant bouncing pillow which our daughter loved. Maximum age for the pillow is about 12, but adults can supervise young children. If you don’t have any young children then try borrowing one from a friend for the day as it’s a great excuse to have a bounce – Great Fun! 🙂 The pillow cannot however be used during wet weather for safety reasons. 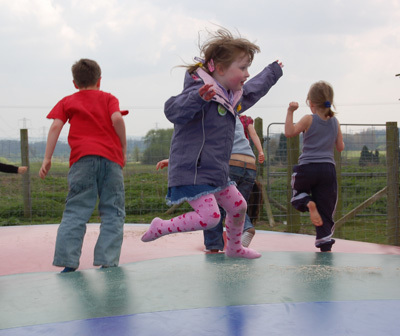 I’d been on a giant pillow before at Heads of Ayr Farm Park in Scotland, which didn’t have a maximum age but they did have more than one jumping pillow and more space. There is a small cafe and some indoor and outdoor picnic tables. The cafe is a bit small when it’s busy, but we were able to sit inside and found a high-chair eventually. Our children had a great time. It just makes it hard going to another farm now as our daughter just asks “can we go to the one with the big pillow?”. This entry was posted on Wednesday, May 6th, 2009 and is filed under Babies, Children, Crafts, Tourism. You can follow any responses to this entry through the RSS 2.0 feed. Both comments and pings are currently closed.